It is used in rated voltage up to AC 500V or DC 1000V control circuit as railway signal transmission and communication,audio signal or automatism signal,the multi-sheath railway signal cable has screen character,which is suitable for laying in electrified railways or others field under strong Interference. 1.1 The ambient temperature :-40 deg.~+60 deg. 1.2 the operating temperature should not be higher than +70deg. 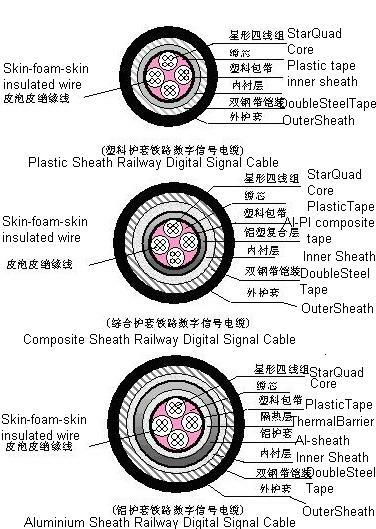 1.3 The ambient temperature under installation ,PVC sheath cable should not be below 0 deg.,PE sheath cable should not be below -20 deg. Cable with length 500m and over do not less than 50% of total delivery length in Order, and with length less than 50m~250m not more than 5% of total delivery length. Tolerance of metering length do not exceed ±0.5%.